To be honest, I still don’t see myself as funny, I guess the fact other people laugh at what I say is a bonus. Suppose the first gig where I got an applause break was when I first realised, I was funny, cause at least I was so funny the audience wasted their energy putting two hands together for it. When I was in my first year at university, I attended the comedy society and did some improv there. One of the members liked what they saw and invited me to an open mic night in the city, I’ve never looked back since. It is always good to keep up with the times as the more relatable your material is towards younger audiences, the better presence you have on social media (presence=promotion). I feel society is very PC nowadays so you do have to be very careful with what you say, but it depends if you are actually that bothered with what people think, which I’m not. Oh this is easy! Chilling on the sofa, watching Netflix, not being bothered if you accidentally fall asleep when watching… bliss. If your comedy style was a soup, what would be the key ingredients? Wow, from an easy question to a challenging one! I’d say the key ingredients are energy, storytelling and audience chatter, I do all three in my set and if I don’t, then clearly something is up with me that day. It is called “Poor Life Choices”, it is a therapeutic experience for the audience, where I not only go over the stupid decisions in my life, but the audience reveal stories about their lives. By the end, we feel like a community but it’s a hilarious community at the same time. You’ve been touring ‘Poor Life Choices’ across the world for quite a wee while now. How has the show evolved in that time? From doing previews in pubs in Cambridge to worldwide shows has been an incredibly quick journey. I find it hard to even process how quick its been. It started with a 35-minute TED talk pretty much now, but now it involves the audience and it has become a solid hour long stand up show with good reviews. How did it go down in America? I am always concerned when taking my stand up outside the UK due to the different reactions I could get from it. I was beyond overjoyed by the different reactions I got from outside the UK and I am returning to America in July, I can’t wait to perform there. Do you like stupid stories? Do you like to watch someone suffer? Do you like comedy? Then come and see ‘Poor Life Choices’, the sell out show where sad times lead to good fortunes. Hello Sonia, so where ya from and where ya at, geographically speaking? Sonia: Like my show’s title: I’m Made in Spain! And to prepare audiences for my show – I ordered a SPANISH SUMMER so everyone can feel like a true local. Sonia: My mom says that as a new born people laughed because I looked like a grumpy old man. I also made these mumbling complaining noises that reminded her of my uncle Antonio … who was (and still is!) a grumpy old man. So making people laugh started pretty early I guess. Sonia: My grandparents’ house was always full of laughter. Their philosophy was ‘When life laughs at you … you laugh right back! Because when the going gets tough … laughter can keep you going’. A wonderful lesson which I hold dear in my heart. Sonia: After Saturday’s FIESTA –Sunday SIESTA! As a Spaniard living in Britain, what do you think of the ongoing Brexit proceedings? Sonia: Like the Spanish festival: LA TOMATINA, (metaphorical) tomato throwing and complete confusion. What are the differences between the Spanish & the British senses of humour? Sonia: Humour is a little different, but luckily there’s no difference between a ‘British laugh and Spanish laugh’, because laughter is our one universal language. What does Sonia Aste do when she’s not being funny? Sonia: Worry about not being funny. You are bringing MADE IN SPAIN to the Brighton Fringe, can you tell us about it? 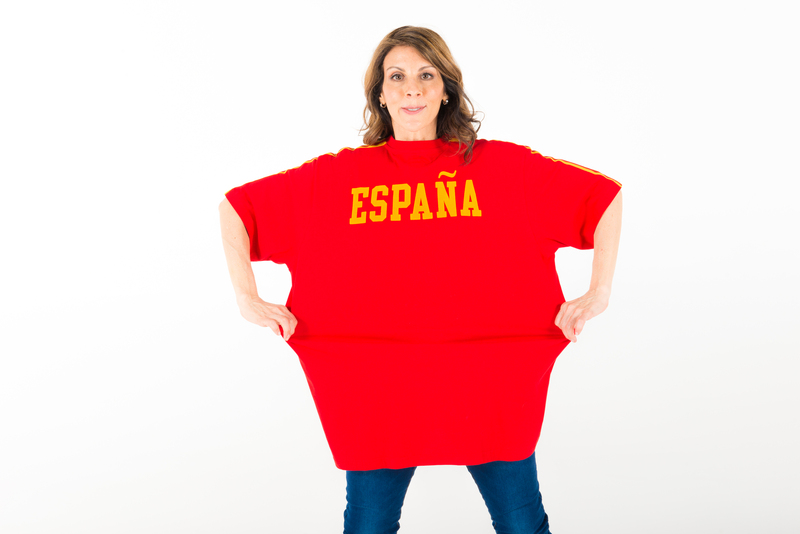 Sonia: With Spain being one of the top destination for British tourists, my show shines a light into our cultural differences and what it means to be ‘Made in Spain’. It’s a fast paced show based on a ‘Tapas Menu’, and the audience chooses what they want to order. I wanted to cater to all comedy tastes and like a good Spanish meal, provide a space to share in the fun and laughter. You say your show will be based around a tapas menu … what would you recommend? Sonia: The menu will change daily, making every show different – but I’d definitely recommend ‘Spanish Song Salad’ and ‘Mum’s Mash’. We will have daily specials too! Have you tweaked the show since your successful run at last year’s Edinburgh Fringe? Sonia: YES! This is part two – brand new flavours while keeping the old favourites in the menu of laughs. Growing up it was Rick and Ade, Alexei Sayle, Fry and Laurie and Rowan Atkinson. I’m slightly older than I look (I’m mid to late 20’s). Now it’s Bill Burr, Steve Coogan and anyone on youtube chucking ping pong balls into glasses from a slight distance. Nathan: I like to have an idea around this time of year for the following year, so I can start creating the material over the next six months in new material nights, I do a regular one in London on Mondays where you hear it all first. I’ve got my idea for next year, and the only danger of that is you put too much focus on the following year too early. It’s a very very very good idea though!! I’m going to take it on a bit of a World Tour, New Zealand and America. A year ago I’d have said writing comedy, a year ago I used to write comedy all the time. On Sunday afternoon maybe I’d have been in the pub or up on Hampstead Heath pretending to see friends but actually I’d have been thinking about comedy, writing comedy in my head. But then, at the Edinburgh Fringe last year, my life changed. I injured my back, in the same way most people injure their backs, by brushing my teeth, so joined a local gym in a bid to sort out my rubbish core. And I met someone. I met a man that would take me on a year of discovery, a truly bizarre year where I didn’t have to write any comedy to churn out another hour show, perfect. You’ve got a new show for 2019 – can you tell us about it? So yes, I’ve never really been one for observational comedy because nothing from my day to day life I really found that amusing. Much as it would be lovely to find a routine from having a shower usually I just turn the shower on, have a wash, and get out of the shower. But after meeting this guy at the gym, this massive, strong man, he’s taken me on such a bizarre journey of discovery and self discovery that, brilliantly, the show has kind of written itself. I won’t give too much away but he started as my personal trainer, and quickly became much more. Everything about him and our relationship is unconventional, and ripe to stick straight into a comedy show. Let’s just say he is round my house a lot now. But he doesn’t use the shower. But if he did there would probably be a routine in it. What it is at about this story that demanding a retelling on stage? Everything. I needed someone to come into my life and shake it up. I think we look for like-minded people to surround ourselves with, but I met this guy who did everything I didn’t. He is at the gym 6am to 11pm every day. That’s all he does. He doesn’t read the news, he doesn’t know what’s going on in the world. He lifts Atlas stones. He’s religious. And he’s opened the door to a new future for me and shone a light on my past. He’s truly changed my life, and my comedy. No one is expecting an observational comedy show from Nathan Cassidy. No one is expecting any show. No one likes stand-up comedy any more. It’s a dying art from. I’m more into piano now. What are the fundamental differences between the Brighton & the Edinburgh Fringes? If you want, you can do the Brighton Fringe without seeing anyone else in the industry. Which I’m not saying for one second is absolutely brilliant, but I guess whatever you do you in life can you surround yourself with people who think your job is the most important thing in the world. Sometimes you need people around you that not only are not in your world, but don’t give a damn about anything in your world. And that can open your eyes to what’s important in life, and the direction you want to go in next. None of what I’m doing in comedy is important, however very, very funny it is. There’s a much bigger picture for me now, and this big, strong man has shown me the light. And there are beaches in Brighton that aren’t freezing. And you don’t go bankrupt.